Percent +3H is the percentage of all spectra that have a charge of +3. Higher Percent +3H indicates that the mass spectrometer may favor long peptides. A high Percent +3H means that there are an unusual number of plus 3 ions. This might mean that the electrospray is behaving erratically. Large Percent +3H means that the other charge states don't get as many ions. 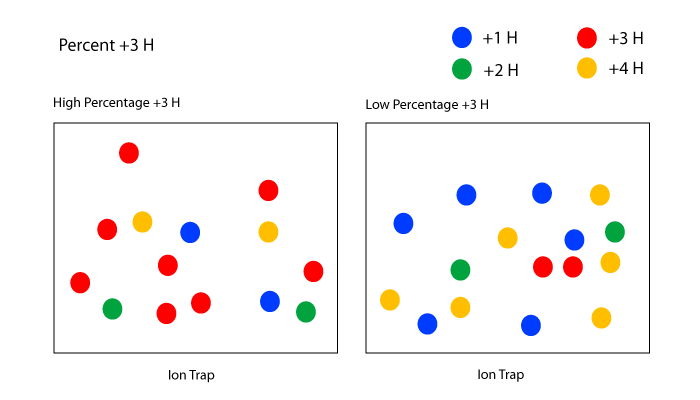 The metrics Percent +1H and Percent +4H also report the ion's charge state. Any ions that are not charge +1, +3, or +4 are probably charge +2. If the distribution of charge differs, it may affect the size of the peptides that are detected. Another way to look at this is with the metric Precursor m/z.